Warning: this is totally off-topic of math. Lately I've made an experiment of sorts, and that is I've checked what it is like to create a website with Weebly. Weebly is a service that lets you build a website with a drag-and-drop interface. 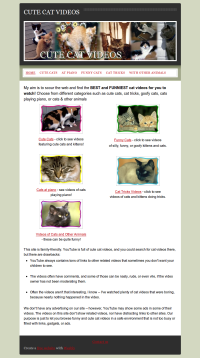 My testing website is called Cute Cat Videos. I've collected a few videos of cats doing tricks, silly cats, cats and kittens with other animals, and such. So far, so good. You can create a simple, small website with Weebly, without technical knowledge. It could be good for anyone (even kids) who want to build a small website without learning html, css, or any of that stuff. I liked the selection of templates. Drag and drop seems to work fine. You can add custom html. You can add videos or other media, or Google Adsense. Currclick is having a sprint sale from March 23 till April 5. Math Mammoth books are on sale for 20% off, in case you are interested! We have great carnival this time: Math Teachers at Play #24. Check it out! I also really liked the idea of giving students the answer, and asking them to explain why and how it is gotten, as is explained in Why is this answer right? But there are many more and Denise has worked hard to create this beautiful carnival so check it out! The Soma cube is a dissection puzzle. It has seven pieces that have to be assembled into a 3x3x3 cube. 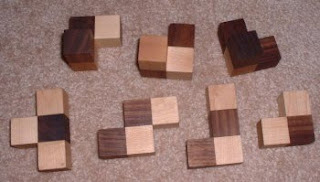 So, that is the main challenge, but you can also arrange the pieces into all kinds of other interesting 3-D shapes. I received a wooden Soma cube from Monkey Pod games. The cube comes in a neat, good-looking wooden box that can be showcased in your bookcase as a decorative item. But, it's certainly not meant for decoration only! It is quite a fun challenge! The Soma cube from Monkey Pod games comes with a little booklet that shows you the solution so you can get the pieces back to the box, but it also shows you several dozen other 3-d shapes to make with the pieces. I enjoyed trying to put together some of those. And the kids enjoyed just playing with the pieces, trying to come up with something interesting, and of course they did! It was great fun for them. 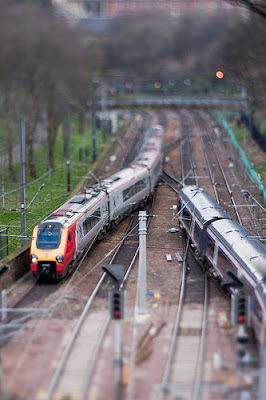 The speed of a freight train is 14km/h slower than the speed of a passenger train. The freight train travels 330 km, in the same time that it takes a passenger train to travel 360 km. Find the speed of each train.Again, an algebra problem about speeds. Again, we will make a simple table about the two trains. The table will have columns for speed, distance, and time. Notice the problem says "in the same time". Let's call that t.
Of course, the goal is to have an equation in a single variable, not in two variables (t and v). Pi day is upon us in a few days... 3/14. I'll refer you to my earlier post about Pi day for some resources and ideas. 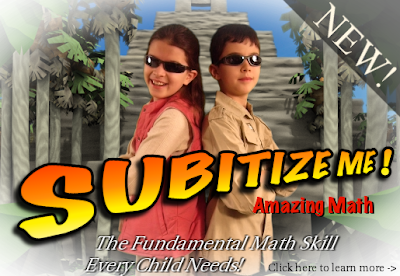 What is "subitizing"? It's probably a new word for most. It basically means being able to recognize instantly how many objects you see, without counting. We all do that with the dots on the face of a dice. People who play dominoes with the larger set also learn to do that with the dots on the dominoes (they can go up to 18). But why would such be important? It is for children, because it promotes number sense, and also ties in with the concepts of addition, subtraction, and even place value. Look at the dominoes in the picture, and especially the one in the front with turquoise dots on the left side and three orange dots on the right. Looking at the turquoise dots, can you tell how many there are without counting? Most of us realize that it is just one less than three rows of three, or nine. So therefore it has eight dots. That is "subitizing". There are now three new books available in the Blue Series. They are all for grades 5-6. The material for these books came from the Light Blue 5th and 6th grade curricula. Please click on the links to learn more and see samples. (with a Touch of Algebra)The main topics studied in this book are simple equations, expressions that involve a variable, the order of operations, long multiplication, long division, and graphing simple linear functions. The idea is not to practice each of the four operations separately, but rather to see how they are used together in solving problems and in simple equations. We are trying to develop student's algebraic thinking. Many of the ideas in this chapter are preparing them for algebra in advance. Math Mammoth Ratios & Proportions & Problem SolvingThis worktext concentrates, first of all, on two important concepts: ratios and proportions, and then on problem solving.